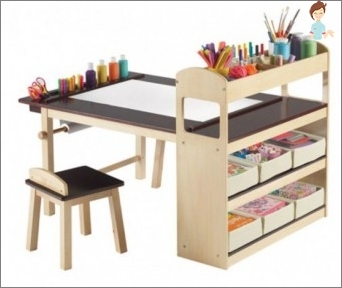 How to make and decorate a children's table with your own hands? Sometimes, the space seems too tight to equip it with cumbersome finished furniture. In this case, the best solution is to make a wooden children's table with your own hands. To make the table as comfortable and safe as possible, it is recommended to order individual parts in a carpentry shop, which has all the tools for high-quality wood processing. 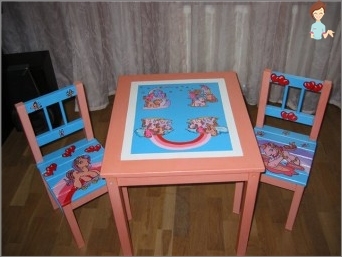 If the house has an old table, you canUse its details to create children's furniture. In this case, a children's table with their own hands is a direct benefit. And if the dad can handle the carpentry tools, the piece of furniture will turn into a real work of art. First of all, it is necessary to determine the heightTable. The most comfortable is the height at which a child with a straight back, placing the elbow on the tabletop, easily reaches out to the temple with his finger. 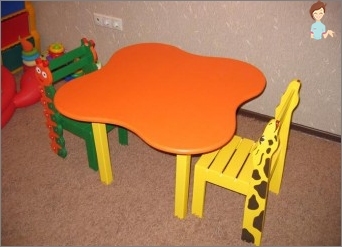 You can use special tables that recommend the height of tables and chairs for children of different ages. The finished wooden table is carefully sanded with fine sandpaper and covered with several layers of varnish. No less simple in the design is a self-made folding children's table, the table top of which is attached to the wall. At any time, you can raise the second part of the countertop and fold the frame. After that, the movable part of the table top descends, and the table occupies a minimum of space. And to make the furniture look beautiful, you can do yourself decuping a children's table. It's not enough just to make it up, it's also important to decorate a new product. And then the technique of decoupage can be useful. By the way - to decorate in this way you can absolutely any furniture. When the pictures dry out, the table top is varnished. A child is a full member of the familyRequires a personal space. This space should be multifunctional and include all the necessary pieces of furniture, including a table needed for games, drawing, doing lessons, modeling, etc. Create coziness and comfort for your crumbs with your own hands! Successful crafts and grateful smiles from your baby!